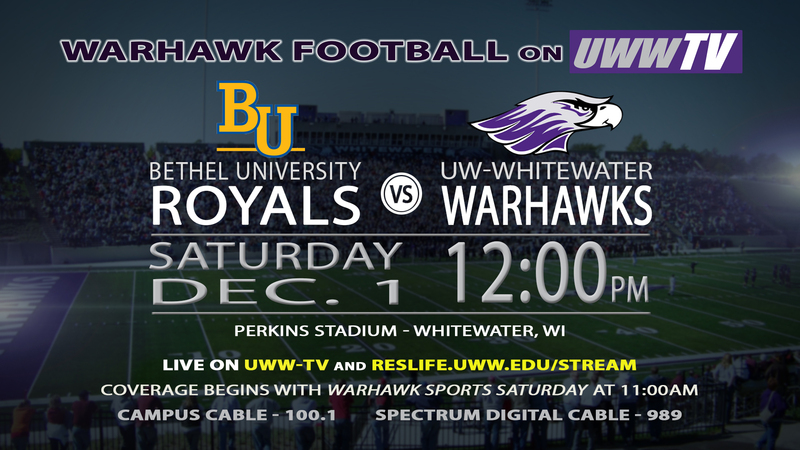 UWWTV – Bethel University Royals Ride into Warhawk Territory, TOMORROW on UWW-TV! 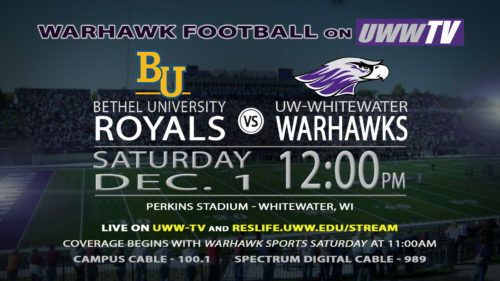 Bethel University Royals Ride into Warhawk Territory, TOMORROW on UWW-TV! A long and winding road of struggle and true athletic competition has lead to this moment. Warhawk football is set to host the Bethel University tomorrow in the third round of the NCAA DIII Football Championship Play-off Tournament. 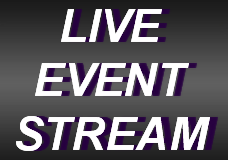 Game time is set to being at 12:00 pm CDT, but UWW-TV will be going LIVE with Warhawk Sports Saturday at 11:00 am CDT. Winner of this battle of strength is set to continue onto the Semifinal, hosted on December 8th, where only the best will continue to the Stagg Bowl Championship game on December 14th, 2018! All NCAA fans know that these last few rounds of the tournament are heated and packed with suspense. You won’t to miss this battle of fury and talents, and lucky for you, you don’t have to! So tune into UWW-TV tomorrow at 12:00 pm CDT!